Hubble Space Telescope has discovered 16 extrasolar planet candidates orbiting a variety of distant stars in the central region of our Milky Way galaxy. The planet bonanza was uncovered during a Hubble survey, called the Sagittarius Window Eclipsing Extrasolar Planet Search (SWEEPS). Hubble looked farther than has ever successfully been searched for extrasolar planets. Hubble peered at 180,000 stars in the crowded central bulge of our galaxy 26,000 light-years away. That is one-quarter the diameter of the Milky Way's spiral disk. The results will appear in the Oct. 5 issue of the journal Nature. This tally is consistent with the number of planets expected to be uncovered from such a distant survey, based on previous exoplanet detections made in our local solar neighborhood. Hubble's narrow view covered a swath of sky no bigger in angular size than two percent the area of the full moon. When extrapolated to the entire galaxy, Hubble's data provides strong evidence for the existence of approximately 6 billion Jupiter-sized planets in the Milky Way. Five of the newly discovered planets represent a new extreme type of planet not found in any nearby searches. Dubbed Ultra-Short-Period Planets (USPPs), these worlds whirl around their stars in less than one Earth day. "Discovering the very short-period planets was a big surprise," said team leader Kailash Sahu of the Space Telescope Science Institute, Baltimore. "Our discovery also gives very strong evidence that planets are as abundant in other parts of the galaxy as they are in our solar neighborhood." Hubble could not view directly the 16 newly found planet candidates. Astronomers used Hubble's Advanced Camera for Surveys to search for planets by measuring the slight dimming of a star due to the passage of a planet in front of it, an event called a transit. The planet would have to be about the size of Jupiter to block enough starlight, about one to 10 percent, to be measurable by Hubble. The planets are called "candidates" because astronomers could only obtain follow-up mass measurements for two of them due to the distance and faintness of these systems. Following an exhaustive analysis, the team ruled out alternative explanations such as a grazing transit by a stellar companion that could mimic the predicted signature of a true planet. The finding could more than double the number of planets spied with the transit technique to date. There is a tendency for the planet candidates to revolve around stars more abundant in elements heavier than hydrogen and helium, such as carbon. This supports theories that stars rich in heavy elements have the necessary ingredients to form planets. The planet candidate with the shortest orbital period, named SWEEPS-10, swings around its star in 10 hours. Located only 740,000 miles from its star, the planet is among the hottest ever detected. It has an estimated temperature of approximately 3,000 degrees Fahrenheit. "This star-hugging planet must be at least 1.6 times the mass of Jupiter, otherwise the star's gravitational muscle would pull it apart," said SWEEPS team member Mario Livio. "The star's low temperature allows the planet to surrvive so near to the star." "Ultra-Short-Period Planets seem to occur preferentially around normal red dwarf stars that are smaller and cooler than our sun," Sahu explained. "The apparent absence of USPPs around sun-like stars in our local neighborhood indicates that they might have evaporated away when they migrated too close to a hotter star." There is an alternative reason why Jupiter-like planets around cooler stars may migrate in closer to the star than such planets around hotter stars. The circumstellar disk of gas and dust out of which they formed extends in closer to a cooler star. Since the discovery of the first "hot Jupiter" around another star in 1995, astronomers have realized this unusual type of massive planet must have spiraled in close to its parent star from a more distant location where it must have formed. The inner edge of a circumstellar disk halts the migration. Planetary transits occur only when the planet's orbit is viewed nearly edge-on. However, only about 10 percent of hot Jupiters have edge-on orbits that allow the planet to be observed transiting a star. To be successful, transit surveys must view a large number of stars at once. The SWEEPS transit survey covered a rich field of stars in the Sagittarius Window. The term "window" implies a clear view into the galactic center, but much of the galactic plane is obscured by dust. 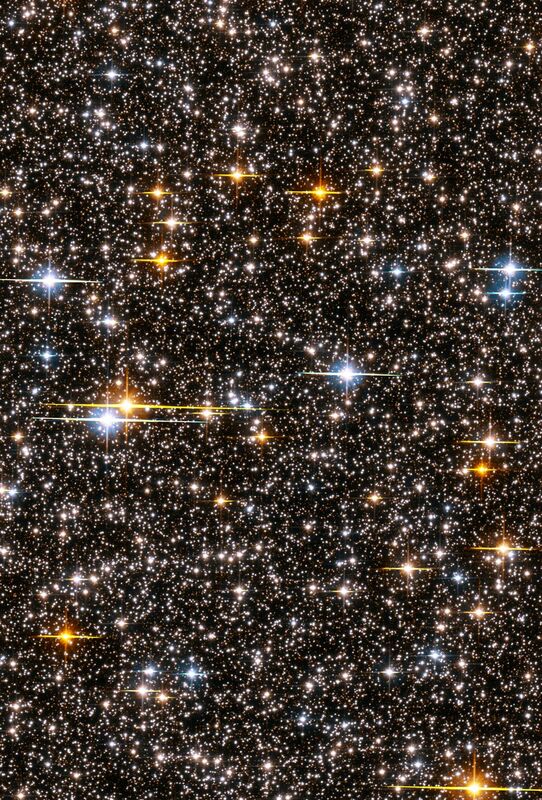 Hubble monitored 180,000 stars for periodic, brief dimming in a star's brightness. The star field was observed over a continuous seven-day period from Feb. 23-29, 2004. To ensure the dimming was caused by an object orbiting a star, the team used Hubble to detect from two to 15 consecutive transits for each of the 16 planet candidates. Two stars in the field are bright enough that the SWEEPS team could make an independent confirmation of a planet's presence by spectroscopically measuring a slight wobble in the star's motion due to the gravitational pull of an unseen companion. They used the European Southern Observatory's Very Large Telescope, located on Mount Paranal in Chile, to measure a slight wobble in the star. One of the planetary candidates has a mass below the detection limit of 3.8 Jupiter masses. The other candidate is 9.7 Jupiter masses, which is below the minimum mass of 13 Jupiter masses for a brown dwarf. A brown dwarf is an object that forms like a star but does not have enough mass to shine by nuclear fusion. Since the stars are so faint and the field of view is so densely packed with stars, measuring the slight wobble in the star's motion using spectroscopy to confirm most of the planet candidates is not feasible. Future telescopes such as NASA's James Webb Space Telescope will provide the needed sensitivity to confirm most of the planet candidates.